Keeping the Pounds Off! : Holiday Therapy Contest - Enter Here! 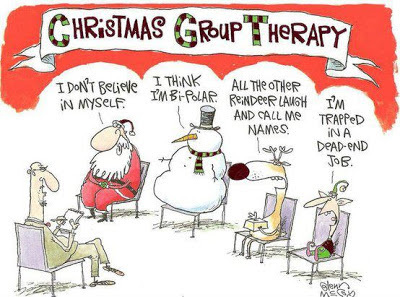 Holiday Therapy Contest - Enter Here! My godmother shared this on Facebook and I got a laugh from it. What would the therapist say if given a voice in this comic? Comment here. Enter up to twelve times. Winner will be announced on the 15th of December and I will ship the ornament on the 17th as long as you given me your address by then. Enter and please make me laugh! "This obviously stems from something your mother did wrong." ;) xo Jane! My guess is the Doctor is the one drawing the comic strip and he is saying to himself "You can't make this stuff up..."
"How does that make you feel?